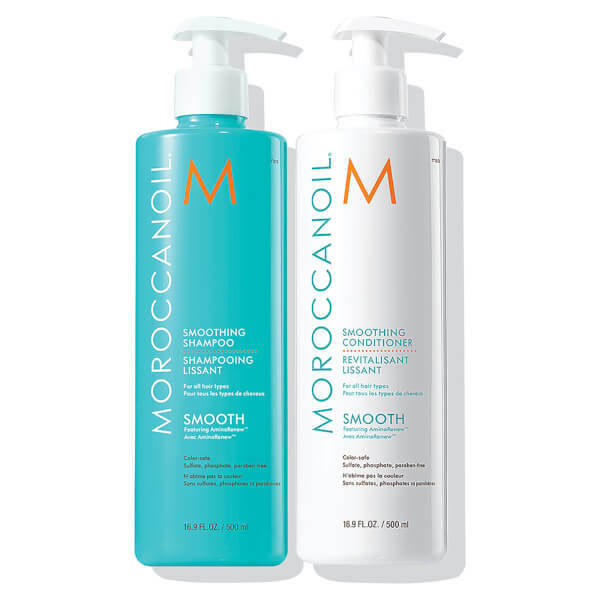 Treat your hair to the benefits of Moroccanoil's Smoothing Shampoo and Conditioner Duo. Working in tandem to control frizzy locks, the nutrient-rich formulas help you to achieve calm, manageable and ultra-smooth hair from root to tip. Transform frizzy hair into manageable and calm, healthy-looking locks with the lightweight Smoothing Shampoo. Its gentle cleansing formula contains AminoRenew™ to strengthen the hair's keratin structure and restore amino acids. Enriched with argan oil and argan butter to leave hair smooth and soft. A creamy conditioner that works to control static flyaways and provide frizz protection to leave you with sleek, healthy locks. Specially formulated with AminoRenew™ to strengthen the hair's keratin structure and restore amino acids. Gentle yet effective, the conditioner is enriched with argan oil and argan butter to leave hair smooth and soft. 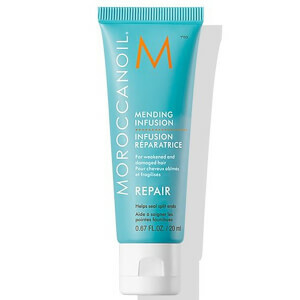 Experience manageable hair that has a boost in radiance. Smoothing Shampoo: Massage throughout wet hair and scalp, adding more water to activate a rich lather. Rinse thoroughly. Smoothing Conditioner: Apply to cleansed, damp hair and massage into the mid-lengths and ends. Leave for 1-2 minutes, then rinse. For best results, use regularly. Smoothing Shampoo: Aqua/Water/Eau, Cocamidopropyl Betaine, Sodium Lauroyl Sarcosinate, Disodium Lauroamphodiacetate, Lysine Carboxymethyl Cysteinate, Parfum/Fragrance, Acrylates Copolymer, Disodium Laureth Oil, Hydrogenated Vegetable Oil, PEG-120 Methyl Glucose Trioleate, Glyceryl Stearate, Caprylyl Glycol, Propylene Glycol, Sodium Lauryl Sulfoacetate, C12-15 Pareth-3, Propanediol, Aminoethylaminopropyl Dimethicone, Sodium Hydroxide, Polyquaternium-7, Chlorphenesin, Phenoxyethanol, Sodium Benzoate, Alpha-Isomethyl Ionone, Linalool, Hydroxyisoheyl 3-Cyclohexene Carboxaldehyde, Butylphenyl Methylpropional. Smoothing Conditioner: Aqua/Water/Eau, Cetyl Alcohol, Lysine Carboxymethyl Cysteinate, Dimethicone, Parfum/Fragrance, Behentrimonium Chloride, Glycerin, Argania Spinosa (Argan) Kernel Oil, Hydrogenated Vegetable Oil, Caprylyl Glycol, Propylene Glycol, Glyceryl Stearate, C12-15 Pareth-3, Isopropyl Alcohol, Aminoethylaminopropyl Dimethicone, Stearyl Alcohol, Polyquaternium-7, Phenoxyethanol, Sodium Benzoate, Sorbic Acid, Alpha-Isomethyl Ionone, Linalool, Hydroxyisoheyl 3-Cyclohexene Carboxaldehyde, Butylphenyl Methylpropional.